...in a good way! Last time we touched on fish it was to voice concern over recent findings about fishing down on the food chain, and threatening larger fish like salmon. 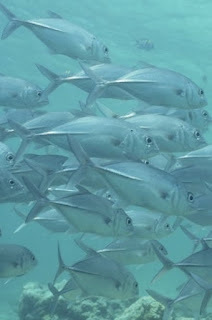 Now we have a slightly rosier picture - the National Oceanic and Atmospheric Administration's (NOAA) fisheries service has recognized an uplift in the populations of six fish species in 2011. Not only is this record improvement, but it indicates that, albeit unpopular, catch limits have been working. NOAA is charged with the task of reporting population numbers of fish stocks within 200 miles of the coast, and taking measures to rebuild those populations as needed. Look like this time around they are succeeding, but long-term maintenance is likely necessary in order keep these results. Who knows, maybe soon you will be able to catch your fish and eat it too! Read the New York Times blog article on the topic.